This is the first time that a publication is tracking the Puma not only in Brazil but worldwide. 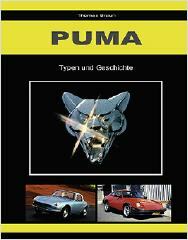 This book describes all Puma models since 1962 with their technical specifications, characteristic details, production time and the achieved output figures. This is not only valid for Puma sports cars but also for Puma trucks and Puma micro buses. In 1962 Rino Malzoni introduced his first sports coupe. After many modifications he went into small series production in 1964. The early Malzoni GT can be seen as the foundation for the global success of the car marque Puma. Today we can look back on more than 20 models and more than 24,000 Puma vehicles. From 1962 to 1967 cars were built with DKW technology. In 1968 the Puma sports cars were based on Volkswagen technology and in 1970 Rino Malzoni and Britinho began with the construction of the Puma GTB based on General Motors technology. Over 10 years the Puma GTB was the most expensive car available in Brazil. For a long time the sport coupes and convertibles that were created in collaboration with Volkswagen do Brazil dominated the streets of Rio de Janeiro and Sao Paulo. This completely revised third edition covers the historic aspects of the marque Puma and current developments within the scene all over the world, including the activities in South Africa.